eCommerce meets Bundling & e-Procurment. When admixx was asked to provide a webshop for their customer Infineon, they ran into some challenges not easily overcome. Infineon asked admixx GmbH to not only design and produce this industry-leading shop, but also to actually link it to their DIG e-Procurment and SAP system as well as offering dynamic ordering bundling to utilize the best of possible procing for their products. "Infineon needed an e-Commerce solution with specific bundling & e-procurement requirements which proved hard to find. Once engaged with UseeY, they truly understood what was needed. They acted fast and scoped out a well outlined solution. They build the webshop, punchout-integration, SAP interface and the bundling tool within the budget and very limited timeframe while even adopting changes due to ongoing insights. They also acted as a liaison between us, the customer and the e-Procurement supplier making this a very smooth and well delivered project." We looked into available solutions in the market, but could not come up with a solution that was robust enough. So instead we did custom development and implemented the Punchout solution for the client while measuring the effectiveness of the order process making sure everything ran smooth. Punchout was however but one hurdle to take. 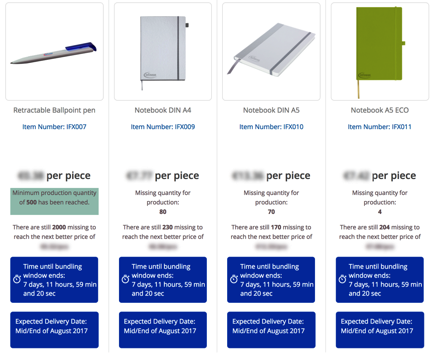 They wanted users to be able to bundle specific orders within a certain time frame while re-calculate each individual order based on the existing product order volume and new placed orders for each product regardless of order volume of the total cart. That was the next challenge. Understanding the requirments and scoping them out is equally - if not more - important then actually building custom software. So once the scope was clear, we designed and build a custom Magento module that met the requirments of both client and distributor. The result? Smiles from Infineon, DIG and admixx next to smooth automated ordering and happy users. We love accepting and overcoming any challenges – great or small. We are involved in business logic, system integrations & e-Commerce since the early days. We understand as no other the special requirements each customer may need. For e-Commerce this is even more so and as such we have our own designed and optimized hosting solutions. Contact us here for any request.